For those who don’t know what polystrate means: poly = many, and strate = layers. A polystrate fossil crosses or protrudes through many layers and as such they are evidence that the number of layers the fossil protrudes through were deposited in less time than the object takes to rot. 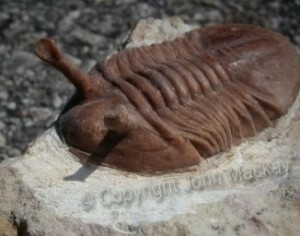 Shells, weird trilobites, fish, vertical leaves and many more fossil in our collection are polystrate and the links below this article will take you to my pictures of some of the ones I have come across. The best known are the many polystrate trees such as the ones we have featured in our DVDs such as Darwin on the Rocks. But go to our picture file and look at trees that were buried at an angle of up to 45degrees. They look as if they were trapped falling over. They are even more spectacular evidence that the normal idea of slow rapid burial and fossilisation is a falsehood. My favourite polystrate is a fossil leaf I found standing upright in diatomaceous rock layers in south central Queensland Australia. Diatomaceous rock is made from Diatoms. These are microscopic creatures made of silica that fit millions to the teaspoon and so the usual argument is it would take vast ages to form even one centimetre of diatomaceous rock layers, let alone metre thick beds. Now my fossil leaf was around 10 cms in height, stood vertically though thousands of layers of diatoms, and since the bottom tip of the leaf was the same age as the top of the leaf those 10 cms of diatom layers got there before the leaf rotted or even fell over. Fast indeed. And yes, in the same deposit was also a vertical tree that went through several meters of strata made of microscopic diatoms. 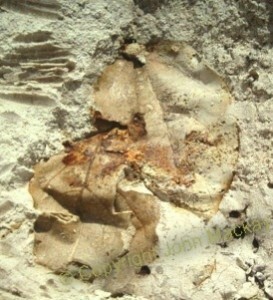 This leaf was green when first excavated and rapidly altered to a red brown and has now faded to a light grey brown. Prof. Derek Ager lists the current observed rate of deposition of siliceous ooze made of diatoms as varying from “as little as 0.05g/cm2 per thousand years in the tropics to as high as 50g/cm2 in the Gulf of California.” (Derek Ager, 1993, The Nature of the Stratigraphical Record, 3rd Ed. John Wiley & Sons, p43. ) At that rate my leaf would have rotted long before it could be buried standing up and the vertical tree nearby would never make it to fossilization either. The present cannot be an accurate guide to the past as Darwin’s mentor Charles Lyell taught him and every generation of modern geologists since. No wonder geologists are being forced to become catastrophic. 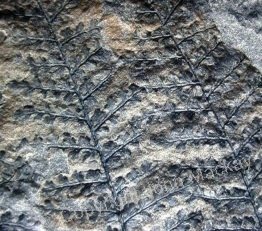 It is absolutely demanded by such evidence as polystrate fossil leaves, which prove the whole bed is definitely catastrophic. Rapidly formed. No help to the millions of years camp. After that I love the polystrate ‘bullet shaped backbones’ or Belemnites from a squid like creature which I found in Northern Ireland. 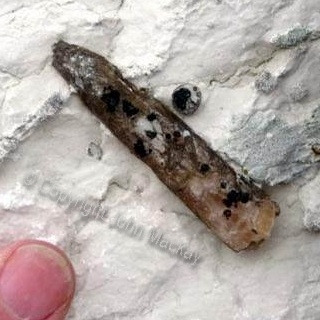 At any one location these elongate bullet like fossils are up to 10 cms in length (4ins) and buried in limestone. They can be found lying along the strata, at right angles across the strata and at any angle in between, so most are in polystrate mode and again show evidence the layers and the fossils have been formed rapidly. Also in our polystrate collections are some three dimensional trilobites from the New York region USA which are so well preserved even their legs and antennae are preserved in action mode in fine black shale. You’ll also enjoy seeing the trilobite with its eyes on elongate storks. No matter which way you buried this guy he had to cross many strata. I got a good laugh when I carried a polystrate Mesosaur into Australia and the customs man wanted to tax it, but was sorely disappointed when he found there was no tax on monsters. 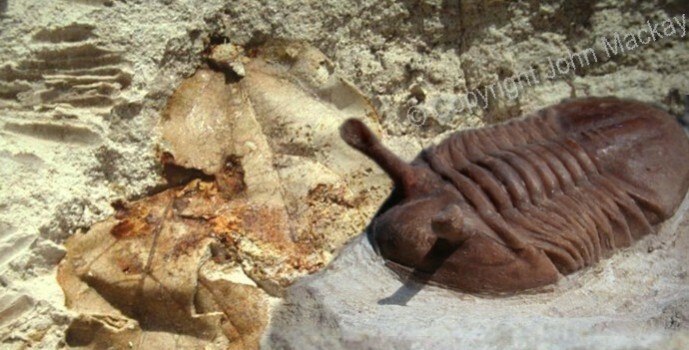 To see more photos of this great fossil and the really important lessons it provides on fast rocks and no evolution click on the Mesosaur link at the end of article. One year I was excavating on the Cumberland Plateau Tennessee coal fields and noticed a plant stem crossing about a 1/3 m (10in) of siltstone layers at about 45 degrees. A fair amount of excavation later it turned out to be a beautiful fern. No slow swamp burial for this fern. And no swamp burial for the fish whose body was buried across several layers of sandy siltstone in a Scottish quarry that Randall Hardy and myself were investigating. No, we didn’t find it, and it’s not in our collection … yet? But its great evidence this fish is also a polystrate. So yes, there are polystrates of just about every fossil known if you look hard enough, and the reality is that any fossils even those that lie parallel to their strata yet are thicker than one lamina of sediment, by definition have to be polystrate. Special thanks to those whose generous help has enabled us to do the research for these fossils. 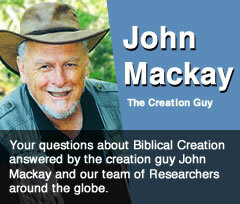 Click Donations to become a supporter.